Looking for examples of contemporary takes on traditional design? Meet our October Remodel of the Month. 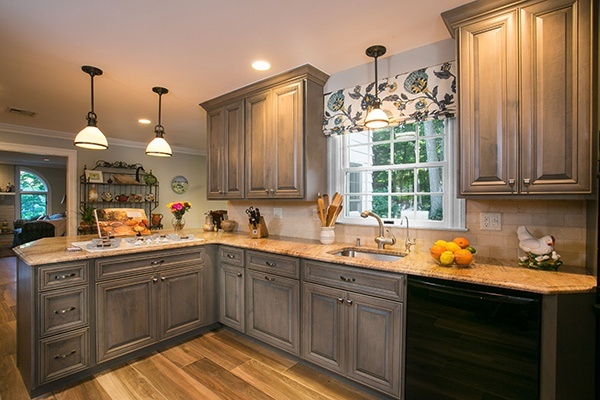 The combination of distressed cabinetry with a trendy gray-tone finish and beautiful accents, reconfigured cabinets and an in-kitchen desk area are all proof that you can have your contemporary cake and eat it with traditional style. One of the first things our design team did was eliminate the soffits and empty air space above the cabinetry, taking the cabinets all the way up to the ceiling. This immediately added lofty height to the design as well as room for decorative dramatic accents - like the beautifully sculpted niche above the oven. The owners wanted to incorporate a gray color palette, but in a way that was exciting and dynamic. The answer was to reface them with Maple Cabinets finished in a Driftwood stain - with a brown glaze (more on that below). These days, about 10% of homeowners are choosing gray as their foundation color. Choosing a distressed effect makes it easy to hide the occasional smudge, print or minor dribble before it can be cleaned up - a major bonus for busy kitchens and/or those with small children and pets. The existing, beige granite countertops were gorgeous and the homeowners loved them. We're firm believers that if you love something about your kitchen, it's worth keeping. 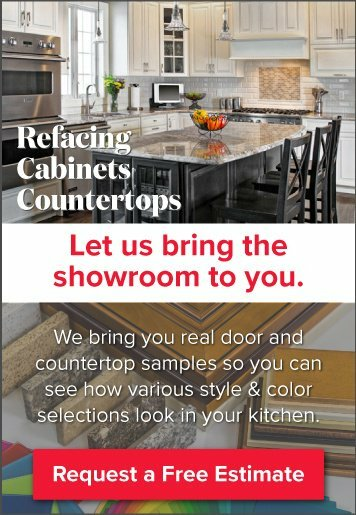 That being said, it's much less costly to reface cabinets around an existing countertop than it is to replace a countertop and cabinetry. 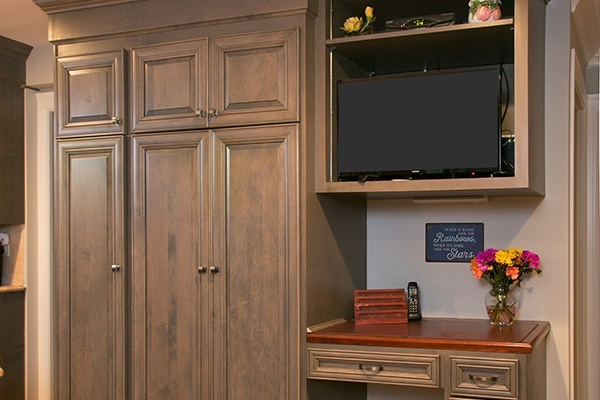 In this case, the homeowners decided to add a brown glaze to the cabinets to tie the color palette together. 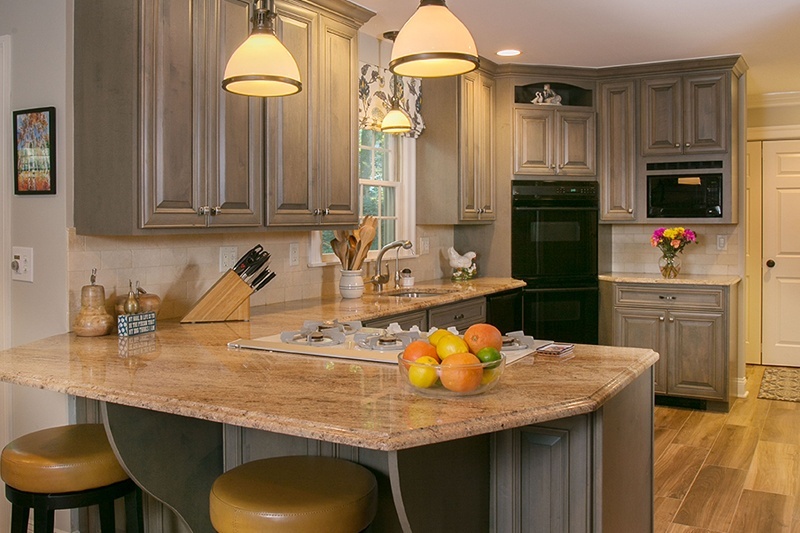 In addition to warming up the cooler gray color, the subtle glaze creates color synchronicity between cream granite coutnertops and gray cabinets. Raised-panel doors that add dimension and offer lots of surface area to capture the warm, brown glaze. Over-sized corbels for visual interest. Converting some of the cabinet boxes to become open shelving for added dimension and a place to display colorful kitchenware and seasonal decor. 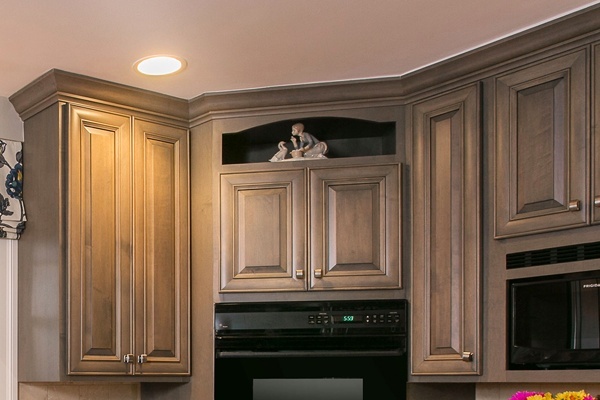 "We loved our kitchen layout, but not the soffits or the look of the traditional cherry cabinets. Working with Kitchen Magic, we were able to preserve our layout. After removing the soffit, they built boxes that extended our cabinet doors to the ceiling. 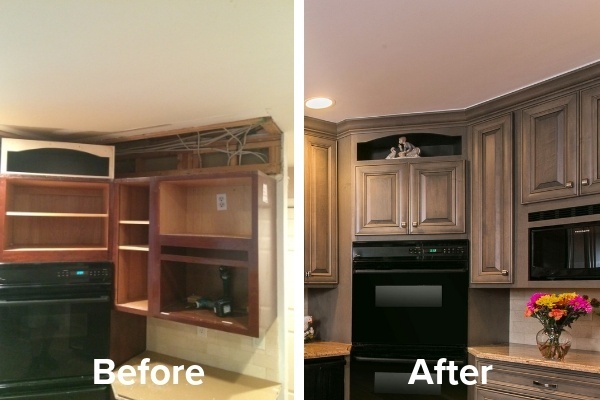 Additionally, they worked with us to veneer portions of our soffit, adding various moldings to create a furniture feeling to an already existing pantry." Finally, these homeowners took advantage of the remodel to add a desk area. Current open floor plan trends, combined with 21st century gadgets that pave the way for convenient work stations that declutter the kitchen and add plenty of space for gadget recharging, bill paying, a mini home office and a to house a kitchen computer for quick recipes. Are you ready to take your kitchen to the next level? 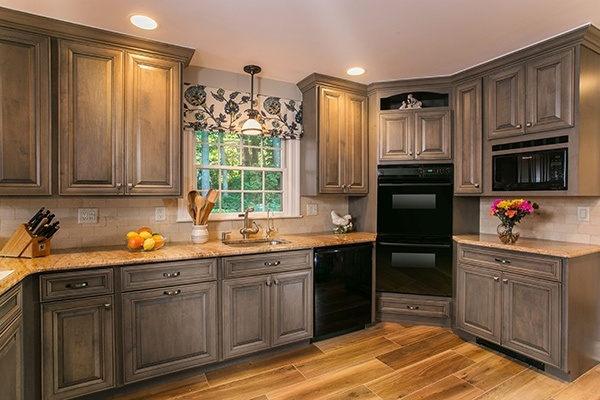 Schedule a free, in-home design consultation with the design professionals at Kitchen Magic. 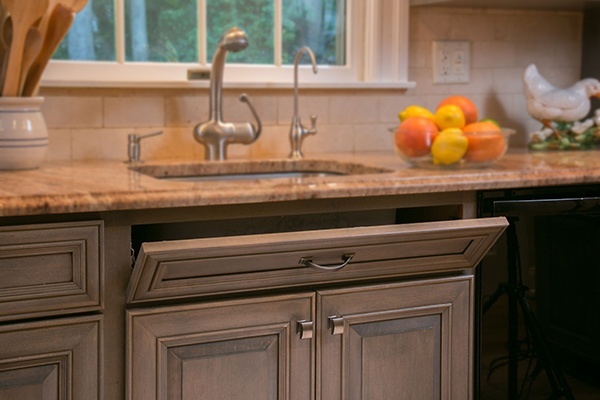 The experts here at Kitchen Magic will design a custom solution just for you. Simply click or call (800) 272-5490.